^ 1.0 1.1 Hurricane Research Division. Hurricane Data for Pacific Hurricanes 1949-2006. National Oceanic and Atmospheric Administration. 2007 [2014-09-22]. （原始内容存档于2011-01-03）. ^ 2.0 2.1 Glossary of NHC Terms. National Hurricane Center. 2013-03-25 [2014-06-15]. （原始内容存档于2014-06-01）. ^ Climate Prediction Center, NOAA. Background Information: East Pacific Hurricane Season. National Oceanic and Atmospheric Administration. 2006-05-22 [2014-09-22]. （原始内容存档于2014-08-27）. ^ 4.0 4.1 4.2 Climate Prediction Center, NOAA. NOAA Expects Below Average 2006 East Pacific Hurricane Season. National Oceanic and Atmospheric Administration. 2006-05-22 [2014-09-22]. （原始内容存档于2013-10-06）. ^ Central Pacific Hurricane Center, NOAA. NOAA Announces Central Pacific Hurricane Season Outlook. National Oceanic and Atmospheric Administration. 2006-05-22 [2014-09-22]. （原始内容存档于2013-10-06）. ^ Central Pacific Hurricane Center. Mission Statement. 2008-07-02 [2014-09-22]. （原始内容存档于2013-12-23）. ^ Chris Landsea; Neal Dorst (ed.). G: Tropical Cyclone Climatology. Hurricane Research Division: Frequently Asked Questions. Atlantic Oceanographic and Meteorological Laboratory. 2011-06-02. G1) When is hurricane season ? [2014-06-25]. （原始内容存档于2014-06-01）. ^ 9.0 9.1 9.2 9.3 9.4 9.5 National Hurricane Center; Hurricane Research Division; Central Pacific Hurricane Center. The Northeast and North Central Pacific hurricane database 1949-2013. United States National Oceanic and Atmospheric Administration's National Weather Service. 2014-07-07 [2014-09-22]. （原始内容存档于2014-09-12）. ^ 10.0 10.1 10.2 10.3 10.4 10.5 10.6 10.7 10.8 10.9 Overview of the 2006 Central North Pacific Tropical Cyclone Season. Central Pacific Hurricane Center. 2006 [2014-09-22]. （原始内容存档于2014-09-04）. ^ RAIV Hurricane Committee. Final Report of the Twenty-Ninth Session (PDF). World Meteorological Organization. 2007 [2008-11-17]. （原始内容存档 (PDF)于2014-08-14）. ^ David Herring. Subtropical Storm off the Coast of Oregon. NASA. 2006-11-02 [2007-12-11]. （原始内容存档于2008-10-26）. ^ 15.0 15.1 15.2 15.3 Pasch, Richard J./National Hurricane Center. Tropical Cyclone Report: Tropical Storm Aletta (PDF). National Oceanic and Atmospheric Administration. 2006-07-15 [2014-08-28]. （原始内容存档 (PDF)于2013-12-15）. ^ 16.0 16.1 Richard Pasch. May Tropical Weather Summary. National Hurricane Center. 2006-06-01 [2014-09-22]. （原始内容存档于2013-12-15）. ^ 17.0 17.1 Alberto Hernández Unzón; M. G. Cirilo Bravo Lujano. Resúmen de la Tormenta Tropical Aletta del Océano Pacífico (PDF). Servicio Meteorologico Nacional, Comisión Nacional del Agua. 2007 [2014-09-22]. （原始内容 (PDF)存档于2012-02-27）. ^ 18.0 18.1 18.2 Avila, Lixion A./National Hurricane Center. Tropical Cyclone Report: Tropical Depression Two-E (PDF). National Oceanic and Atmospheric Administration. 2006-07-05 [2014-08-28]. （原始内容 (PDF)存档于2013-05-21）. ^ Alberto Hernández Unzón and Cirilo Bravo Lujano. Resumen de la Depresión Tropical 2E del Océano Pacifico (PDF). Servicio Meteorológico Nacional. 2006 [2014-09-22]. （原始内容 (PDF)存档于2012-02-27）. ^ Juan Cervantes y Laura Reyes. Amenaza depresión tropical pasar a ciclón. El Universal. 2006-06-05 [2014-09-22]. （原始内容存档于2014-01-02）. ^ Richard D. Knabb. Tropical Cyclone Report: Hurricane Bud (PDF). National Hurricane Center. 2006 [2008-10-10]. （原始内容存档 (PDF)于2014-09-04）. ^ 22.0 22.1 Kevin R. Kodama. July 2006 Hawaii Precipitation Summary. Honolulu National Weather Service. 2006 [2007-06-13]. （原始内容存档于2007-06-13）. ^ 23.0 23.1 23.2 23.3 23.4 23.5 23.6 23.7 Franklin, James L./National Hurricane Center. Tropical Cyclone Report: Hurricane Carlotta (PDF). National Oceanic and Atmospheric Administration. 2006-09-04 [2014-08-28]. （原始内容存档 (PDF)于2013-05-21）. ^ Richard Pasch. Tropical Storm Carlotta Discussion Four. National Hurricane Center. 2006-07-12 [2014-09-22]. （原始内容存档于2012-10-16）. ^ Blake/Knabb. Hurricane Carlotta Discussion Six. National Hurricane Center. 2006-07-13 [2014-09-22]. （原始内容存档于2012-10-16）. ^ Jack Beven. Hurricane Carlotta Discussion Nine. National Hurricane Center. 2006-07-14 [2014-09-22]. （原始内容存档于2012-10-16）. ^ Rhome/Avila. Tropical Storm Carlotta Discussion Sixteen. National Hurricane Center. 2006-07-15 [2014-09-22]. （原始内容存档于2012-10-16）. ^ 28.0 28.1 28.2 Beven, Jack/National Hurricane Center. Tropical Cyclone Report: Hurricane Daniel (PDF). National Oceanic and Atmospheric Administration. 2006-11-30 [2014-08-28]. （原始内容存档 (PDF)于2013-10-16）. ^ Daniel Brown. Hurricane Daniel Discussion Sixteen. National Hurricane Center. 2006 [2014-09-22]. （原始内容存档于2013-10-22）. ^ 30.0 30.1 30.2 30.3 Stewart, Stacy R./National Hurricane Center. Tropical Cyclone Report: Tropical Storm Emilia (PDF). National Oceanic and Atmospheric Administration. 2006-11-29 [2006-12-04]. （原始内容存档 (PDF)于2013-05-21）. ^ Stacy Stewart. Tropical Storm Emilia Discussion Nine. National Hurricane Center. 2006-07-22 [2014-09-23]. （原始内容存档于2012-10-17）. ^ Tucson, Arizona National Weather Service. Review of July 25, 2006 Severe thunderstorm and Flash flood event. 2006 [2014-09-23]. （原始内容存档于2012年3月6日）. ^ Staff Writer. Horse fire declared fully contained. San Diego Union Tribune. 2006-07-30 [2014-09-23]. （原始内容存档于2012-10-12）. ^ 34.0 34.1 Rhome, Jamie R./National Hurricane Center. Tropical Cyclone Report: Tropical Storm Fabio (PDF). National Oceanic and Atmospheric Administration. 2006-09-13 [2014-08-28]. （原始内容存档 (PDF)于2013-12-15）. ^ Kevin R. Kodama. August 2006 Precipitation Summary in the State of Hawaii. Honolulu National Weather Service. 2006-09-06 [2008-08-01]. （原始内容存档于2008-08-01）. ^ Stuart Hinson. Event Report for Hawaii. National Climatic Data Center. 2006. ^ 37.0 37.1 37.2 Mainelli, Michelle/National Hurricane Center. Tropical Cyclone Report: Tropical Storm Gilma (PDF). National Oceanic and Atmospheric Administration. 2006-08-23 [2014-08-28]. （原始内容存档 (PDF)于2013-05-21）. ^ Brennan/Stewart. Tropical Depression Eight-E Discussion Number 2. National Hurricane Center. 2006 [2014-09-23]. （原始内容存档于2012-10-17）. ^ 39.0 39.1 Daniel P. Brown. Tropical Cyclone Report: Hurricane Hector (PDF). National Hurricane Center. 2006-09-28 [2014-09-23]. （原始内容存档 (PDF)于2013-05-21）. ^ Brown/Stewart. Tropical Depression 09-E Discussion Number 22. National Hurricane Center. 2006 [2014-09-23]. （原始内容存档于2013-12-15）. ^ Pasch/Fiorino. Tropical Depression 09-E Discussion Number 23. National Hurricane Center. 2006 [2014-09-23]. （原始内容存档于2013-12-15）. ^ Pasch/Fiorino. Tropical Depression 09-E Discussion Number 27. National Hurricane Center. 2006 [2014-09-23]. （原始内容存档于2013-12-15）. ^ Roberts/Stewart. Tropical Depression 09-E Discussion Number 30. National Hurricane Center. 2006 [2014-09-23]. （原始内容存档于2013-12-15）. ^ Joint Typhoon Warning Center. Super Typhoon 01C. 2007 [2011-06-07]. （原始内容存档于2011-06-07）. ^ Leone, Diana. Hawaiian-named storm hits Johnston Isle. Star Bulletin. 2006-08-23 [2014-09-25]. （原始内容存档于2012-08-06）. ^ Andrew Leonhard. Wake evacuated -- Airmen airlift 188 from Pacific Island. Air Force Print News. 2006-08-29 [2014-09-25]. （原始内容存档于2014-09-25）. ^ Associated Press. Wake Island evacuated as Super Typhoon Ioke closes in. Anchorage Daily News. 2006 [2008-05-28]. （原始内容存档于2008-05-28）. ^ Advisory Council for Historic Preservation. Spring 2007 Case Digest — Protecting Historic Properties (PDF): 17. 2007 [2014-09-25]. （原始内容 (PDF)存档于2013-02-16）. ^ National Climatic Data Center. Event Report for Alaska. 2006 [2010-04-15]. （原始内容存档于2010-04-15）. ^ 51.0 51.1 Blake, Eric S./National Hurricane Center. Tropical Cyclone Report: Hurricane Ileana (PDF). National Oceanic and Atmospheric Administration. 2006-10-04 [2014-08-28]. （原始内容存档 (PDF)于2014-01-02）. 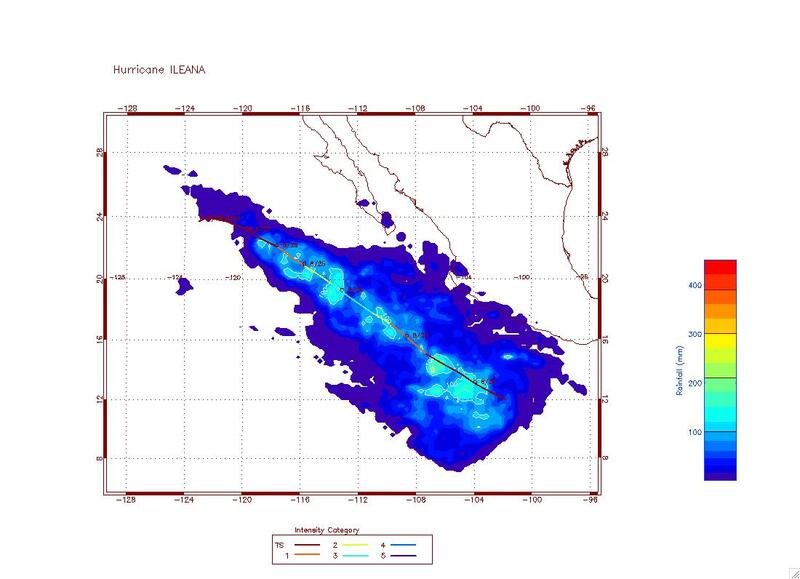 ^ Tropical Rainfall Measuring Mission data. Rainfall from Ileana. National Aeronautics and Space Administration. 2007 [2014-09-25]. ^ Staff Writer. The week in Mexico. San Diego Union-Tribune. 2006-08-23 [2014-09-25]. （原始内容存档于2014-01-02）. ^ 54.0 54.1 54.2 54.3 Pasch, Richard J./National Hurricane Center. Tropical Cyclone Report: Hurricane John (PDF). National Oceanic and Atmospheric Administration. 2006-11-16 [2014-08-28]. （原始内容存档 (PDF)于2014-01-02）. ^ Mainelli/Pasch. Hurricane John Discussion Ten. National Hurricane Center. 2006 [2014-09-25]. （原始内容存档于2012-10-17）. ^ Rhome/Beven. Hurricane John Discussion Eleven. National Hurricane Center. 2006 [2014-09-25]. （原始内容存档于2012-10-17）. ^ Mainelli/Pasch. Hurricane John Discussion Fourteen. National Hurricane Center. 2006 [2014-09-25]. （原始内容存档于2012-10-17）. ^ Jack Beven. Hurricane John Discussion Nineteen. National Hurricane Center. 2006 [2014-09-25]. （原始内容存档于2014-05-06）. ^ International Federation of Red Cross And Red Crescent Societies. Mexico: Hurricane John Information Bulletin No. 1. ReliefWeb. 2006-08-30 [2014-09-25]. （原始内容存档于2014-05-06）. ^ Servicio Meteorológico Nacional. Resumen del Huracan "John" del Océano Pacífic (PDF). 2006 [2014-09-25]. （原始内容 (PDF)存档于2012-02-27）. ^ Antonio Alcantar. Hurricane John whips Mexico's Baja, power cut. Reuters. 2006 [2014-05-06]. （原始内容存档于2012-08-06）. ^ Agence France-Presse. Hurricane John leaves four dead, two missing in Mexico. 2006 [2014-05-06]. （原始内容存档于2014-05-06）. ^ Staff Writer. Remnants of John could soak U.S. Southwest. United Press International. 2006 [2012-02-07]. （原始内容存档于2012-02-07）. ^ Fabiola Martinez. Seis muertos y 2 desaparecidos por las lluvias en Durango y Tamaulipas. 2006 [2014-05-06]. （原始内容存档于2013-12-15）. ^ National Climatic Data Center. Event Report for New Mexico. National Oceanic and Atmospheric Administration. 2006. ^ Staff Writer. Remnants of Hurricane John caused flooding, mudslides in Calif. and elsewhere in Southwest. Moscow-Pullman Daily News. Associated Press. 2006-09-01 [2014-09-25]. ^ 68.0 68.1 68.2 Avila, Lixion A./National Hurricane Center. Tropical Cyclone Report: Hurricane Kristy (PDF). National Oceanic and Atmospheric Administration. 2006-10-12 [2014-08-28]. （原始内容存档 (PDF)于2013-05-21）. ^ Knabb/Mundell. Hurricane Kristy Discussion Six. National Hurricane Center. 2006-08-31 [2014-09-25]. （原始内容存档于2012-10-17）. ^ Knabb, Richard D./National Hurricane Center. Tropical Cyclone Report: Hurricane Lane (PDF). National Oceanic and Atmospheric Administration. 2006-11-30 [2006-12-01]. （原始内容存档 (PDF)于2013-12-03）. ^ Staff Writer. Tropical Storm Lane lashes Mexico's Pacific coast, heads toward Baja. McCook Daily Gazette. Associated Press. 2006-09-15 [2014-09-25]. ^ 72.0 72.1 Coordinación General de Asesoria y Políticas Públicas Gobierno del Estato. Sociedad y gobierno unidos ante los daños del Huracán Lane. 2006 [2013-11-22]. （原始内容存档于2012-02-18）. ^ Valdez Cardenas, Javier and Leon, Raymundo. En Sinaloa, los daños por Lane suman 1,200 millones de pesos. La Jornada. 2006-09-24 [2013-11-22]. （原始内容存档于2012-10-04）. ^ Franklin, James L./National Hurricane Center. Tropical Cyclone Report: Tropical Storm Miriam (PDF). National Oceanic and Atmospheric Administration. 2006-10-29 [2006-11-22]. （原始内容存档 (PDF)于2013-05-21）. ^ Tanabe/Houston. Tropical Depression Two-C Discussion Three. Central Pacific Hurricane Center. 2006-09-19 [2014-09-25]. （原始内容存档于2012-06-14）. ^ 76.0 76.1 Beven, Jack/National Hurricane Center. Tropical Cyclone Report: Tropical Storm Norman (PDF). National Oceanic and Atmospheric Administration. 2006-11-30 [2014-08-29]. （原始内容存档 (PDF)于2013-05-21）. ^ Servicio Meteorológico Nacional. Resumen de la Tormenta Tropical "Norman" Del Océano Pacífico (PDF). 2006 [2012-02-27]. （原始内容 (PDF)存档于2012-02-27）. ^ Juan Cervantes Gómez. Suspenden clases en Acapulco por tormenta tropical "Norman". El Universal. 2006-10-16 [2014-09-26]. （原始内容存档于2014-01-02）. ^ 79.0 79.1 79.2 Staff Writer. Desbordan lluvias ríos en Guerrero. La Journada. 2006-10-17 [2014-09-26]. ^ 80.0 80.1 80.2 Stewart, Stacy R./National Hurricane Center. Tropical Cyclone Report: Tropical Storm Olivia (PDF). National Oceanic and Atmospheric Administration. 2006-10-28 [2014-08-29]. （原始内容存档 (PDF)于2013-02-25）. ^ James Franklin. Tropical Depression 16-E Discussion Number 1. National Hurricane Center. 2006 [2014-09-26]. （原始内容存档于2012-10-18）. ^ Richard Pasch. Tropical Storm Olivia Discussion Number 6. National Hurricane Center. 2006 [2014-09-26]. （原始内容存档于2012-10-18）. ^ Knabb/Willis. Tropical Depression Olivia Discussion Number 7. National Hurricane Center. 2006 [2014-09-26]. （原始内容存档于2012-10-18）. ^ Andy Nash. Tropical Depression Four-C Discussion One. Central Pacific Hurricane Center. 2006-10-13 [2014-09-26]. （原始内容存档于2012-03-20）. ^ Federal Emergency Management Agency. National Situation Update. 2006-10-17 [2012-07-03]. （原始内容存档于2012-07-03）. ^ Rhome, Jamie R. and Berg, Robert J./National Hurricane Center. Tropical Cyclone Report: Hurricane Paul (PDF). National Oceanic and Atmospheric Administration. 2006-11-20 [2014-08-29]. （原始内容存档 (PDF)于2013-05-21）. ^ Mark Stevenson. Tropical Storm Paul Weakens. The Washington Post. Associated Press. 2006-10-25 [2014-09-26]. ^ Staff Writer. Hurricane Paul kills two in northwestern Mexico. Reuters. 2006-10-26 [2014-09-26]. （原始内容存档于2014-01-02）. ^ Alex Morales. Tropical Depression Paul Rains on Mexico, Weakens Over Land. Bloomberg.com. 2006-10-26 [2014-09-26]. （原始内容存档于2014-09-26）. ^ Consejo Directivo del Instituto Sinaloense de Acuacultura. Acta de la Sesión Ordinaria del Consejo Directivo del Instituto Sinaloense de Actuaculture, Celebrada el Día 10 de Noviembre de 2006, en la Ciudad de Culiacán, Sinaloa. 2006 [2008-11-17]. （原始内容 (DOC)存档于2012-02-18）. ^ 91.0 91.1 Mainelli, Michelle/National Hurricane Center. Tropical Cyclone Report: Tropical Depression Eighteen-E (PDF). National Oceanic and Atmospheric Administration. 2006-11-13 [2014-08-29]. （原始内容存档 (PDF)于2013-02-25）. ^ 92.0 92.1 Jack Beven. Tropical Depression Eighteen-E Discussion One. National Hurricane Center. 2006-10-26 [2014-09-25]. （原始内容存档于2012-10-18）. ^ Blake/Pasch. Tropical Depression Eighteen-E Discussion Three. National Hurricane Center. 2006-10-27 [2014-09-25]. （原始内容存档于2012-10-18）. ^ Jack Beven. Tropical Depression Eighteen-E Discussion Five. National Hurricane Center. 2006-10-27 [2014-09-25]. （原始内容存档于2012-10-18）. ^ 95.0 95.1 95.2 95.3 Brown, Daniel P./National Hurricane Center. Tropical Cyclone Report: Tropical Storm Rosa (PDF). National Oceanic and Atmospheric Administration. 2006-11-27 [2014-09-26]. （原始内容存档 (PDF)于2013-02-25）. ^ Stacy Stewart. Tropical Depression Nineteen-E Discussion Number 1. National Hurricane Center. 2006 [2014-09-26]. （原始内容存档于2012-10-18）. ^ Eric Blake. Tropical Depression Nineteen-E Discussion Number 3. National Hurricane Center. 2006 [2014-09-26]. （原始内容存档于2012-10-18）. ^ 98.0 98.1 Stacy Stewart. Tropical Depression Nineteen-E Discussion Number 5. National Hurricane Center. 2006 [2014-09-26]. （原始内容存档于2012-10-18）. ^ Daniel Brown. Tropical Depression Nineteen-E Discussion Number 4. National Hurricane Center. 2006 [2014-09-26]. （原始内容存档于2012-10-18）. ^ 100.0 100.1 Blake, Eric S./National Hurricane Center. Tropical Cyclone Report: Tropical Depression Twenty-E (PDF). National Oceanic and Atmospheric Administration. 2006-11-14 [2006-11-22]. （原始内容存档 (PDF)于2014-02-03）. ^ Stacy Stewart. Tropical Depression Twenty-E Discussion One. National Hurricane Center. 2006-11-11 [2014-09-25]. （原始内容存档于2014-02-24）. ^ 102.0 102.1 Pasch, Richard J. and Roberts, David P./National Hurricane Center. Tropical Cyclone Report: Hurricane Sergio (PDF). National Oceanic and Atmospheric Administration. 2006-11-29 [2006-11-30]. （原始内容存档 (PDF)于2013-05-21）. ^ Servicio Meteorológico Nacional. Resumen del Huracan "Sergio" del Océano Pacífic (PDF). 2006 [2014-09-26]. （原始内容 (PDF)存档于2013-12-09）. ^ 104.0 104.1 National Hurricane Center. Worldwide Tropical Cyclone Names. National Oceanic and Atmospheric Administration. 2008 [2008-05-14]. （原始内容存档于2014-08-28）. ^ Dennis H. McCarthy. National Weather Service Instruction Tropical Cyclone Names and Pronunciation Guide (PDF). 2007 [2014-09-25]. （原始内容存档 (PDF)于2013-10-17）. ^ The Nation's Hurricane Program: An Interagency Success Story (PDF). Interdepartmental Hurricane Conference. 2007 [2013-04-02]. （原始内容 (PDF)存档于2013-04-02）.